This lasagna was destined to be a failure. I could tell it from the start. Here's what happened. Brian hates white sauces, so I set out to make a red one. But every single recipe was so difficult. So when I came across this one, I IMed him "You probably wouldn't like this, right?" And he said, "Probably not." It's the one I ended up making. Strike one. You know that cooking scene in Mrs. Doubtfire? That basically happened. Strike two. Finally, once the store-bought lasagna noodles were cooked, they decided to stick together in one block. Strike three. I texted Brian that I wasn't adding lasagna making to my resume. But then there was a round two (because I had $12 in mushrooms I refused to let go to waste, and because I couldn't possibly blog about a total failure), and I'm adding round two to my resume. If you can stomach (figuratively, literally) using a stick and a half of butter in a pasta dish, this is one heck of a lasagna. I can stomach it. I have stomached it for the past five meals. It's worth stomaching. **I added a clove of garlic. Because I add a clove of garlic to everything. Bring a large pot of water to a boil with one tablespoon salt and a splash of oil. Add the lasagna noodles and cook for 10 minutes, stirring occasionally. Drain and set aside. For the white sauce, bring the milk to a simmer in a saucepan. Set aside. Melt eight tablespoons (one stick) of the butter in a large saucepan. Add the flour and cook for one minute over low heat, stirring constantly with a wooden spoon. Pour the hot milk into the butter-flour mixture all at once. Add one tablespoon salt, the pepper, and nutmeg, and cook over medium-low heat, stirring first with the wooden spoon and then with a whisk, for 3-5 minutes, until thick. Set aside off the heat. Separate the mushroom stems from the caps and discard the stems. Slice the caps 1/4-inch thick. Heat two tablespoons of oil and two tablespoons of the butter in a large (12-inch) saute pan. When the butter melts, add half of the mushrooms, sprinkle with salt, and cook over medium heat for about five minutes, until the mushrooms are tender and they release some of their juices. If they become too dry, add a little more oil. Toss occasionally to make sure the mushrooms cook evenly. Repeat with the remaining mushrooms and set all the mushrooms aside. To assemble the lasagna, spread some of the sauce in the bottom of an 8 by 12 by 2-inch baking dish. 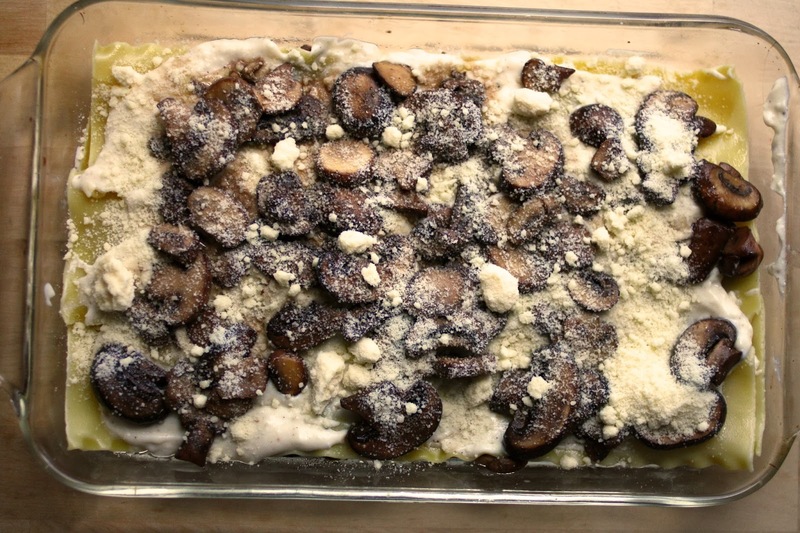 Arrange a layer of noodles on top, then more sauce, then 1/3 of the mushrooms and 1/4 cup grated Parmesan. Repeat two more times, layering noodles, sauce, mushrooms and Parmesan. Top with a final layer of noodles and sauce, and sprinkle with the remaining Parmesan. Bake the lasagna for 45 minutes (or until the top is browned and the sauce is bubbly). Allow to sit at room temperature for 15 minutes. Serve hot!